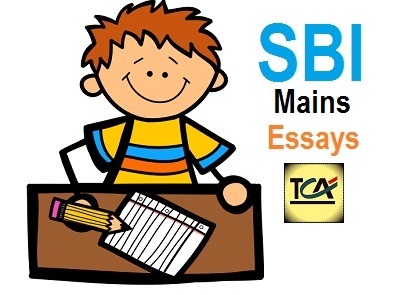 We have tried our best to cover the latest hot issues that may come in your SBI mains descriptive test–essay section. 3. NITI Aayog: Towards A Better India? 4. What India can learn from Nepal earthquake? 7. Mahendra Singh Dhoni, retirement from Test Cricket – it is too early. 8. To Keep Ganga Clean the puja’s should not be performed on the bank of the river, do you agree? 9. What do you understand by ‘governance’? Critically analyse the challenges to governance and the elements of good governance. 9. What is happening to Indonesian Flights? Is it merely an accident or carelessness? 13. Describe some of the newly launched welfare schemes and policies in India. 13. In the light of recently released Socio Economic and Caste Census (SECC), examine how poverty has been defined in India by various committees and commissions. Also critically comment how poverty in India is linked to the caste factor. 5. Have We Become Slaves Of Technology ? You can send us your own written essay from any of the above topic (do not send us copy-paste essays). Best essays will be published in our website with your name (mention your name in the end of the essay).